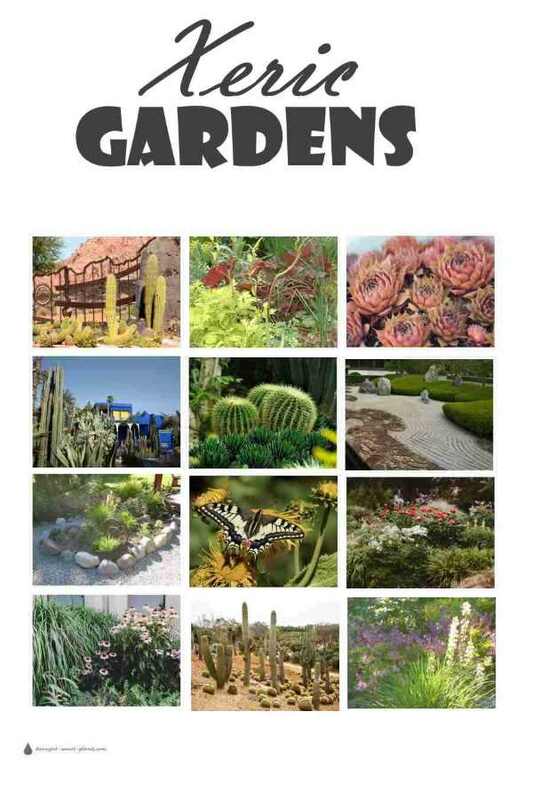 Xeric gardens, even though low maintenance, are not necessarily a dry desert looking place, with hardy cacti and rocks, although in my garden rocks certainly play an important part. Choose some of the garden plants that have the ability to withstand drought. Plant them thoughtfully in well prepared garden beds, and mulch with stone, pebble or lava rock mulch to give them the benefit of the tiny amount of moisture in the soil. This will give your garden plants lush, lovely growth, even without water. Planting in zones, with plants that need the same kind of care all together in a group helps to eliminate maintenance to almost nothing, unless you like to putter in the garden, of course. A xeric garden is an intimately intertwined eco-system of plants, insects, birds and small mammals, and above all, a haven of peace for the gardener. 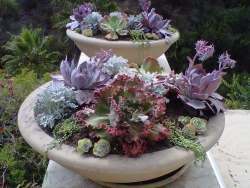 Xeriscaping is the art of plant placement, water conservation and other management strategies for water wise gardening. Thoughtful selection of plants from many different groups ensures that you have food sources and safe habitats for wildlife. I grow many xeric garden plants for rustic crafts. Some of the plants that I commonly use are willows (Salix), Red Osier Dogwood (Cornus stolonifera), and native clump maple (Acer douglasii) among other fast growing shrubs. Investigate the potential of shrubs and trees in your area to see which plants native to your locale are most suitable for these uses. This rock retaining wall is home to many small creatures, and the flowers of the many Sedum planted here are a butterfly and bee magnet. Many commonly grown xeric plants from our great-grandmothers time are some of the very best drought tolerant plants; not only beautiful they are sought after as pollinator attractants in your nectar corridor particularly these plants for bees. They are also prized for their medicinal properties. That's why they're still around and popular as ever! Water is essential in even a desert garden or xeriscaping. Plants still require moisture; it's up to us to conserve water, and use it wisely. 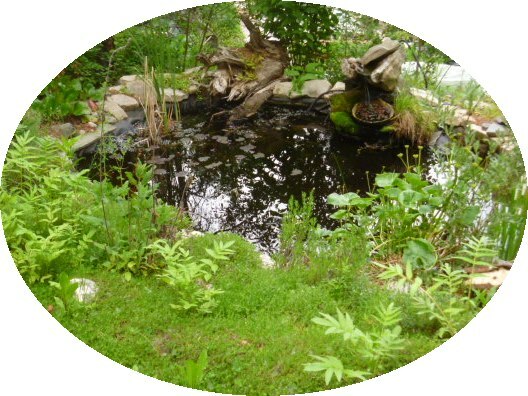 An ecosystem pond will attract birds and other creatures to help with pest control, and add life and activity to your garden. Rain water harvest to direct precious moisture to the right place is a cost savings too. Many plants have the ability to dig deep into the earth, finding moisture that has seeped in from previous rainfall or snow melt. 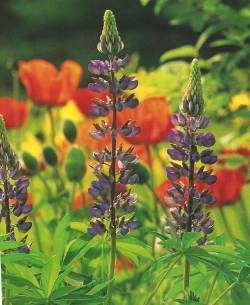 Lupines (Lupinus) and many other legumes are examples of this type of plant, with a long thick taproot. If you look at the roots of day lilies (Hemerocallis) you can see that they are fleshy, able to save water. Others such as thyme have a fine netting of roots spreading far beyond the top growth of the plant. They make a long lived drought tolerant lawn in the right place. Even moss and lichen have the ability to survive long dry periods. There are many tactics that enable the plant to either seek out moisture hidden in the soil, or to store it, or go dormant until better conditions occur. Ways that you can successfully build your xeric garden are to choose plants with these strategies, add compost to your xeric garden soil, and mulch well. Mulching is essential for keeping moisture in the soil, and for adding small amounts of slow released nutrients. I like the look of lava rock, especially around plants such as Sedum or Sempervivum, but other kinds of rock look equally good. Rock or pebble mulches are best used in permanent plantings of perennials, herbs or shrubs, not around annuals or vegetables. Small river rock or gravel, sifted to remove really large boulders is beautiful for a dry creek bed or used around mixed perennials and shrubs. Even areas that are composed almost entirely of boulders can become beautiful xeric gardens like this one in Greys County in Ontario (this link opens in a new window) by utilizing the rocks and pebbles as mulch. 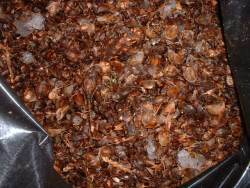 These kinds of non-flammable mulches are now recommended for use in areas where there is a risk of wildfires. Shale in red or grey can add a new dimension to a rockery or scree garden. Agricultural waste such as straw, wood chips and moldy hay can be used in your organic vegetable garden as long as you can keep an eye on slugs or other pests which love the damp conditions found there. I collect the discarded scales from Douglas fir cones after the squirrels finish with them, as these and other organic mulches such as chopped leaves, pine needle mulch, bark and compost are perfect around woodland plants. 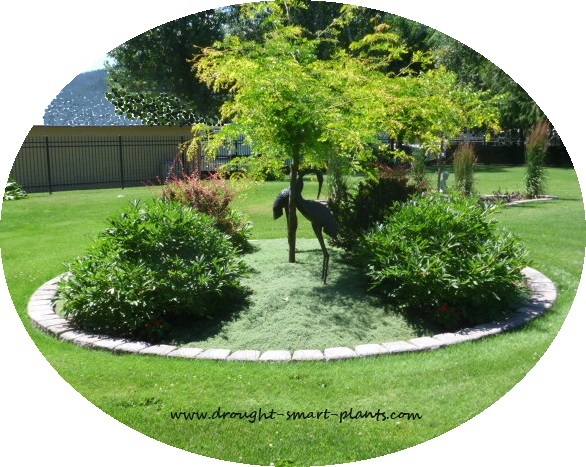 Find out about more garden mulches here. The additional organic matter will benefit your soil as these kinds of mulches rot down over time. If you look under these mulching materials, the soil will be damp for a long time. 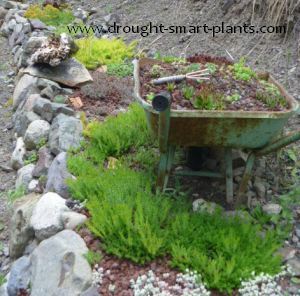 See how Mother Nature goes about protecting her garden from drought and take inspiration from it. 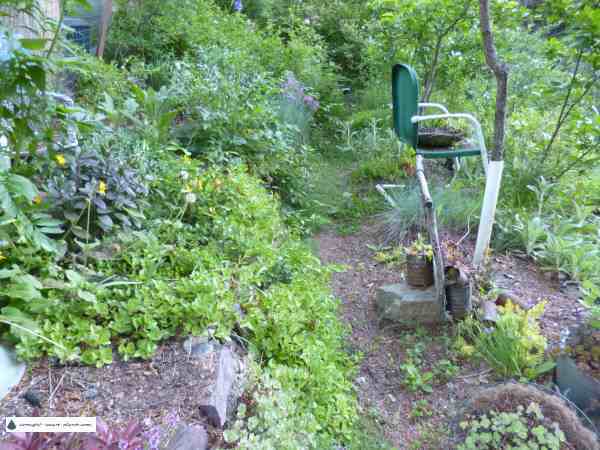 Be innovative and sustainable, using materials that otherwise would be taken to the curb, such as leaves and grass clippings to make your xeric garden glow with health.